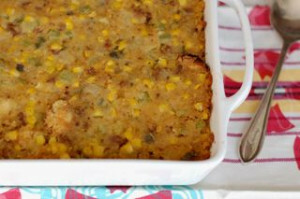 You’ll love this southern inspired dressing for your Thanksgiving table! 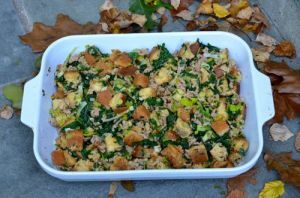 Buttery brioche is the base of this dressing mixed with italian sausage, leeks, collard greens and lots of fresh herbs. 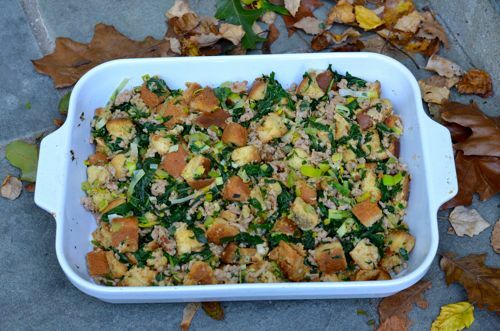 It’s super easy to toast your own bread for this dressing and layer your flavors. I love using leeks in place of the onions for a more subtle onion taste. Just be sure to clean them well before using them, they can have some dirt. I suggest soaking them a little in water before cutting. When cooking with leeks use the white parts only and discard the green tops. From by the bay, wishing you collard green food memories! Preheat oven to 400 degree F. Place bread cubes in a single layer on two rimmed large baking sheets. Bake until toasted about 10-12 minutes. Set aside to cool. In a large skillet cook sausage meat, crumbling the meat with a fork until fully cooked, about 10 minutes. Remove meat with a slotted spoon and place into a large mixing bowl. Add butter to the same skillet, melt butter and then add leeks, celery, thyme and sage. Saute together until softened about 10 minutes, separating the leek rings. Remove from heat and add to the bowl with the cooked sausage meat. Use the same skillet to add the collard greens and wilt about 5 minutes. Add 2 cups chicken stock and let simmer for another 10 minutes. Add collard greens and stock to the bowl.. Add the toasted bread cube, rubbed sage and parsley to the bowl. Add 2 cups of chicken stock. Mix the ingredients together and season with salt and pepper. If dressing is not moist add the additional cup of stock. Mix well. The dressing can be made up to this point one day in advance and refrigerate until ready to bake. To bake the dressing, remove from the refrigerator and let it come to room temperature. Bake in a 350 degree F oven for 30 minutes, until dressing is heated through the top is golden brown. Remove from oven and serve warm. 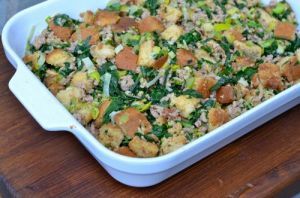 This entry was posted in side dish and tagged brioche recipes, collard green recipes, dressing recipes, fall recipes, leek recipes, sausage recipes, sausage stuffing recipes, stuffing recipes, Thanksgiving recipes on November 20, 2014 by entertainingbythebay. Let me start with the simple fact that any stuffing or dressing that I would serve my family along with a Roasted Turkey needs to have some type of sausage meat in the recipe. This rule was served hard and fast by my niece many years ago. Allow me to quote her very words, ” don’t mess around with the stuffing Aunt Mare”! So when I was messing around in the kitchen working on a new dressing recipe, two things were clear, the recipe had to be so good that the family could accept a new version of one of their favorite dishes and the recipe needed to include sausage meat. I choose a wonderful soft chorizo to breakdown and fry up for this dressing. I brought a prepared cornbread to save time, toasted it in the oven and this was the base. Next it was matter of adding some of my favorite flavors together, including fresh corn and sage. This dressing was a big hit with my family including my niece. I predict this will be a big hit for your Thanksgiving as well. From by the bay, wishing you yummy sausage dressing food memories! To make dressing place a large skillet on medium heat and cook chorizo, crumbling the meat with a fork until fully cooked, about 10 minutes. Remove meat with a slotted spoon and place into a large mixing bowl. Add butter to the same skillet, melt butter and then add the celery and onion. Saute ingredients together until softened about 10 minutes. Add the garlic and corn, cook another 1 to 2 minutes. Add the herbs and cook another minute. Remove from heat and add to the bowl with the cooked chorizo meat. Add the bread cubes and chicken stock to the bowl. Mix the ingredients together and season with salt and pepper. The dressing can be made up to this point one day in advance and refrigerate until ready to bake. Remove from refrigerator and allow to come to room temperature. Place dressing into a lightly buttered baking dish. Bake in a 350 oven for 30 minutes. Remove from oven and serve warm. 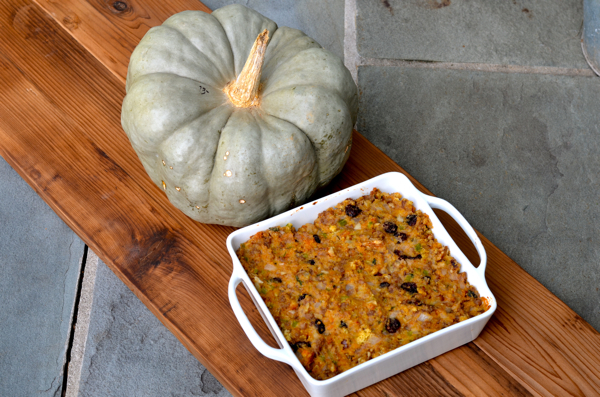 This entry was posted in side dish and tagged chorizo recipes, corn bread recipes, fall foods, fall recipes, sausage stuffing recipes, stuffing recipes, Thanksgiving recipes on May 24, 2014 by entertainingbythebay.